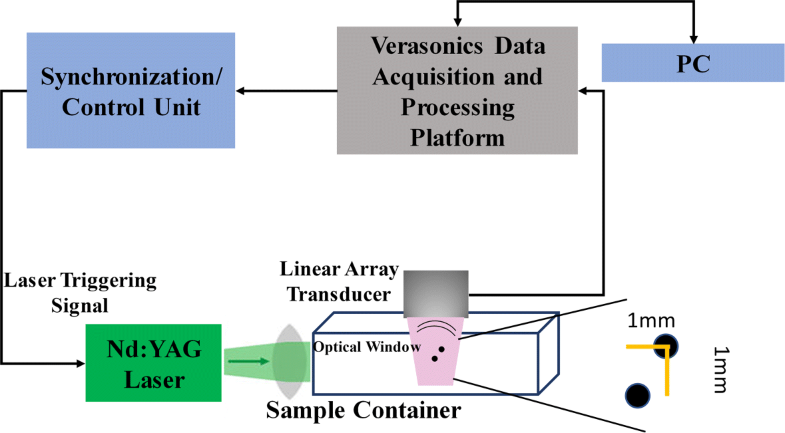 In photoacoustic imaging (PAI), a short electromagnetic pulse, i.e. laser or radio frequency (RF), illuminates the target of imaging, and Ultrasound (US) waves are generated based on the thermoelastic effect [1, 2]. In comparison with other imaging modalities, PAI has multiple advantages leading to many investigations [3, 4]. The main incentive in PAI is having the merits of the US imaging spatial resolution and the optical imaging contrast in one imaging modality . PAI can be used in different fields of study such as tumor detection [6, 7], ocular imaging  and functional imaging [9, 10]. Moreover, contrast agents and nanoparticles play a significant role in PAI [11, 12]. PAI can be separated into two fields: photoacoustic tomography (PAT) and photoacoustic microscopy (PAM) [13, 14]. PAT, for the first time, was successfully used as in vivo functional and structural brain imaging modality in small animals . In PAT, an array of elements may be formed in linear, arc or circular shape, and mathematical reconstruction algorithms are used to obtain the optical absorption distribution map of the tissue [16, 17, 18]. 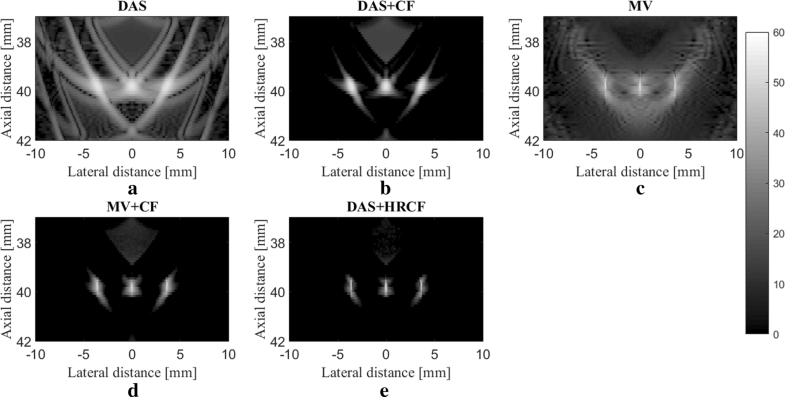 Most of the used reconstruction algorithms for image formation in PAI are based on some assumptions leading to artifacts and disturbing effects on the formed photoacoustic (PA) images. One of the challenges in PA image formation is related to reduction of these effects for different number of transducers and properties of imaging media [19, 20, 21]. Some modifications should be considered if an algorithm in US imaging is going to be used in PAI. These modifications have led using different hardware to implement an integrated US-PA imaging device [22, 23]. DAS is the most commonly used beamforming algorithm in PAI. However, it leads to a low quality image, having a wide mainlobe and high level of sidelobes . Adaptive beamformers, commonly employed in radar, have the ability of weighting the aperture based on the characteristics of detected signals, providing a high quality image with a wide range of off-axis signals rejection. MV can be treated as one of the commonly used adaptive methods in medical US imaging [25, 26]. Vast variety of modifications have been investigated on MV such as complexity reduction [27, 28], shadowing suppression , using eigenstructure to enhance MV performance [30, 31], and combination of MV and multi-line transmission (MLT) technique . 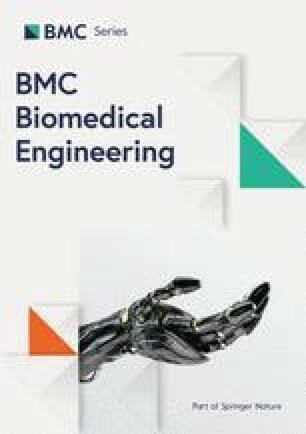 Matrone et al.proposed a new algorithm namely delay-multiply-and-sum (DMAS), as a beamforming technique for medical US imaging . Double stage DMAS (DS-DMAS), outperforming DMAS in the terms of contrast and sidelobes, was introduced for the linear-array US and PAI [34, 35, 36]. Minimum variance-based DMAS has been proposed for resolution improvement in DMAS while the level of sidelobes would be retained [37, 38]. 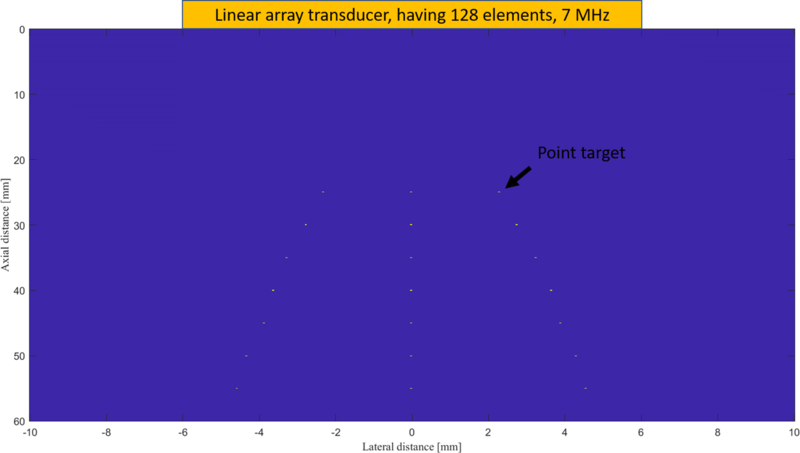 Coherence factor (CF) can be mentioned as one of the prevalent weighting methods in beamforming field . 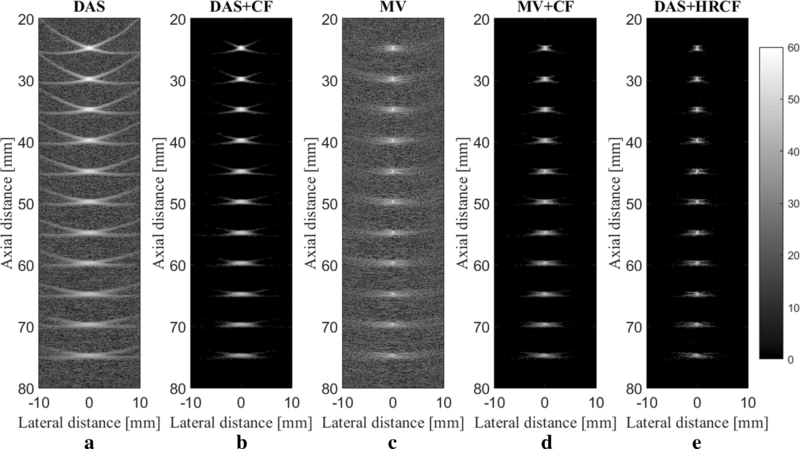 The performance of CF has been investigated for US imaging and PAI in  and , respectively. 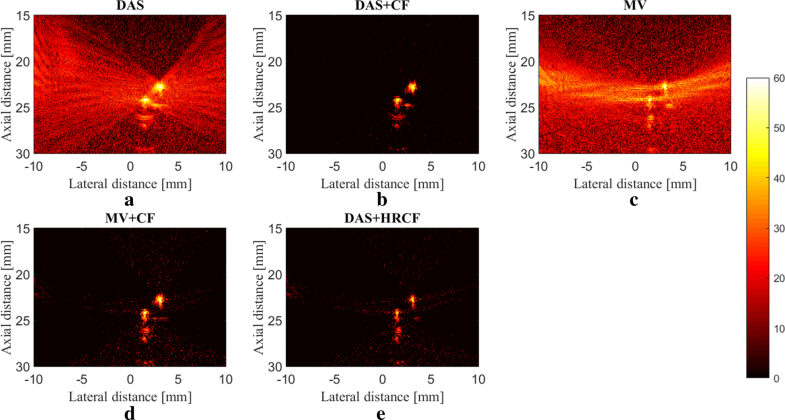 Short-lag spatial coherence beamforming was also used to enhance the visualization of prostate brachytherapy seeds [42, 43]. 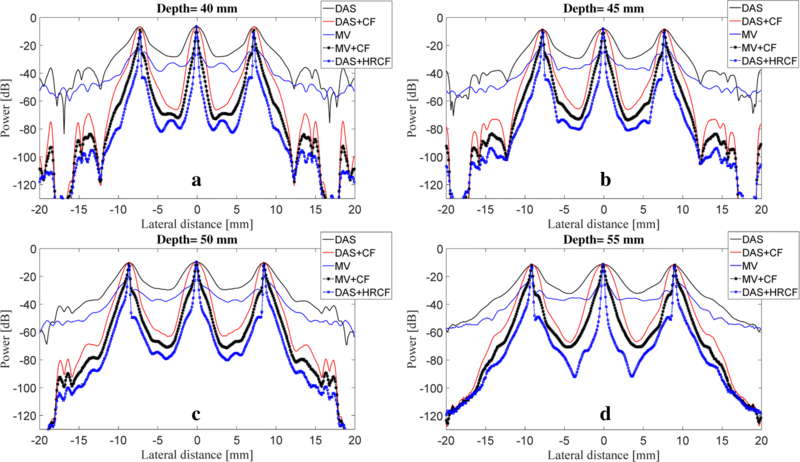 Moreover, a high resolution CF (HRCF) has been investigated for high-frame rate US imaging . Recently, a modified version of the CF has been reported by the authors where the aim was to achieve a higher contrast compared to the conventional CF .